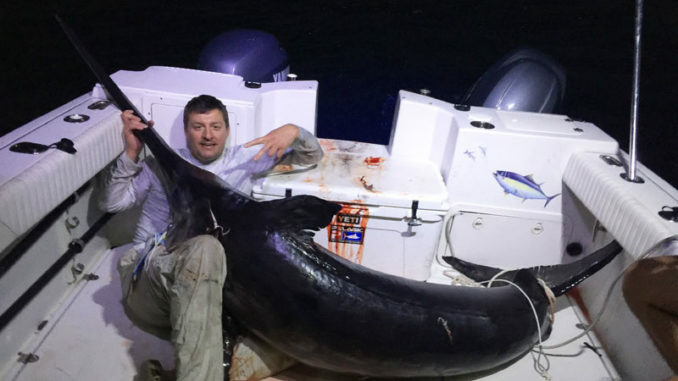 Chris Negulescu poses with the massive 328.4-pound broadbill swordfish he landed along with his nephew, Alex Negulescu, and Eric Hebert, Saturday out of Venice. Alex Negulescu, his uncle Chris Negulescu and Eric Hebert ventured out of Venice Marina early Saturday before 6 a.m. in Chris’ 27-foot Glacier Bay, with their plan being to troll for some wahoo and then venture out to swordfish grounds to see if they could get a bite. Incredibly, none of the three Baton Rouge residents had ever actually landed a sword before — but that dramatically changed for the trio when they hooked up on their very first drop of the day in about 1,200 feet of water. 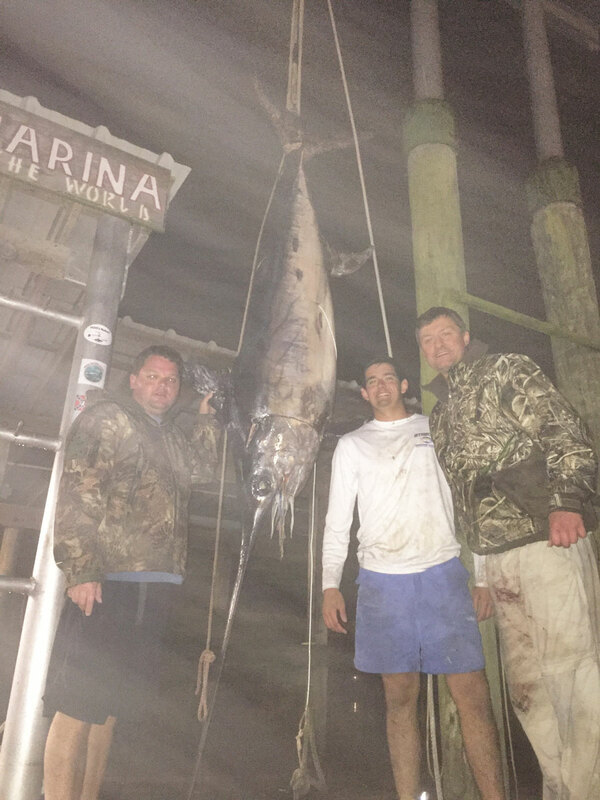 Almost 15 hours after they departed, they triumphantly returned to the marina in dense fog Saturday night with a massive swordfish that tipped certified scales there at 328.4 pounds. Although heavy enough to qualify as the state’s new No. 1 sword, the fish is ineligible for the record books because it was harvested with an electric reel. Alex said the day started pretty successfully as they trolled for wahoo, hooking three fish and putting two in the boat — a 43- and 20-pounder. Then they headed out to their sword grounds, and things instantly got very interesting on the very first drop of the afternoon about 1 p.m. The giant sword bit a skirted mahi belly rigged up on an 11/0 Mustad hook, and what would become a 5 1/2-hour battle of give and take got started. “I think the leader probably came in and out of the reel like 50 times,” Alex said, noting they were rigged up with a 150-foot, 200-pound mono wind-on leader and 100-pound Power Pro braid spooled on a Kristal Electric XL-621 reel. “We would get like halfway up the leader, and it couldn’t reel anymore. So I had to hand-line the rest of the 75 feet in because the reel couldn’t lift that much weight. 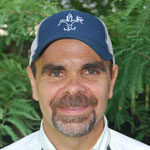 Over several hours, the anglers made steady progress in bringing the fish up from the depths, and Alex said it jumped twice during the epic struggle. “We kept making big wide circles around the fish to keep it from touching the boat,” he said. “Eventually, the fish was about 20 feet behind the boat on top of the surface. My uncle got the harpoon and hurled it like a javelin through the air and stuck it in the fish. It was dark and and the fog was rolling in at that point, so landing a record-sized fish wasn’t really discussed, he said. From the left, Eric Hebert, Alex Negulescu and Chris Negulescu pose with the massive 328.4-pound broadbill swordfish they caught Saturday afternoon out of Venice. The fish was 18 pounds heavier than the current state record fish, but is ineligible for recognition because it was harvested with an electric reel. The fish’s beak measured 47 inches, and Alex said they didn’t measure the sword’s overall length or girth at the marina, but he estimated it was between 10 and 11 feet long. After cleaning the fish, he figured they got between 150 and 200 pounds of swordfish steaks from the big female. And although it won’t go down in the state record books as a new No. 1, Alex said it’s a day — and a catch — none of them will ever forget. 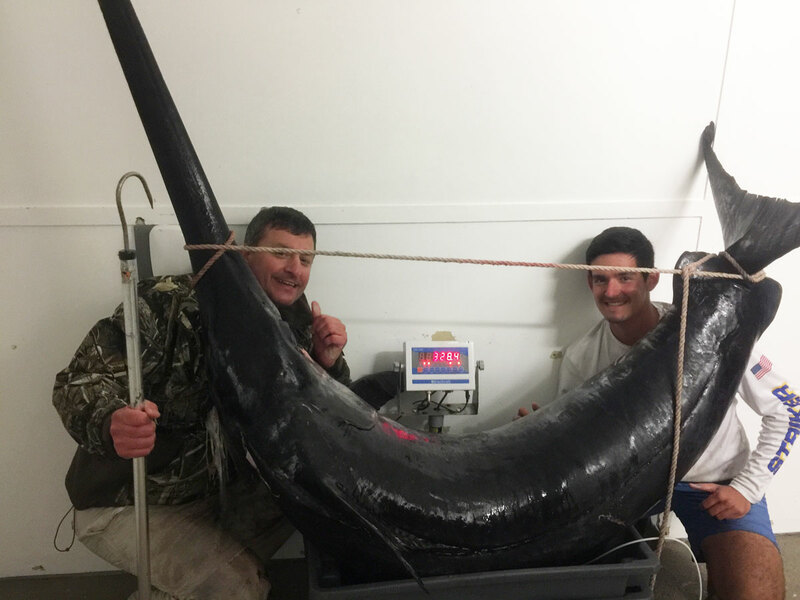 The current state record broadbill swordfish, according to the Louisiana Outdoor Writers Association, was caught by Thomas Dantin in the Mississippi Canyon in July of 1980, which weighed 310 pounds even.